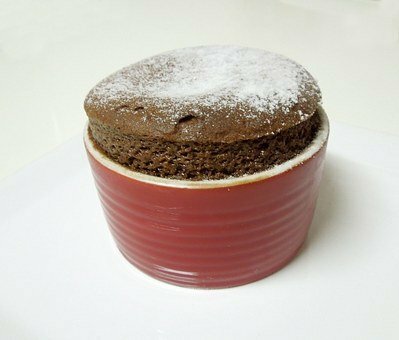 Butter four Soufflé ramekins and sprinkle with cocoa powder, knocking out excess. In a medium bowl, mix Nutella and 4 egg yolks. In a separate medium bowl, whisk 4 egg whites until foam starts to form. Add cream of tartar. Fold 1/3 of the whites into the Nutella mixture until fully incorporated. Add the remaining whites to the mixture and fold gently, but thoroughly until the mixture is smooth. Pour the mixture in the ramekins, clean the rims so the Soufflé rises evenly, and bake for 20 minutes.